I grew up drinking soups that my mom made for us using the slow cooker. My mom worked in shift in town which requires her to switch 2 buses and juggling between a full time job, taking care of children, grocery shopping and cleaning. She needed to manage everything and ensured she provide all the nutrition for us. While my most of my friends ate outside food, my mom insisted to cook for us even though it took up a lot of her time. She always said that the act of cooking is relatively quick- basically you just throw everything in the wok and cook away. However it is the preparation (buying groceries, cutting and washing the vegetables, fish and meat) and the washing that take up a lot of time. Her effort paid off because we seldom got sick when we were young. Mom always said she could not afford to have us sick because she had to work and it was difficult to take off. One the dish she often prepare that helped to maintain our help is the simple Chinese soup boiled using a slow cooker. In the Western world, you may be used to taking Campbell soup, oxtail soup or some soup where they put a lot of chicken broth. Traditional Chinese soup is a little different. It is not thick or starcy. We basically boiled either chicken or pork bones and mix with other items for the taste. Until now, even if I am not able to find the time to cook, I would still try to boil some Chinese soups from time to time. Especially if I am feeling as if I am going to fall sick, feeling lethargic or out of sorts. Long term of drinking such soups will help to maintain our health and energy. 1. ABC soup– where jumbled up ingredients are carrot, tomato, potatoes, corn and cabbage. A lady told me to add some rock sugar in any soup to balance the flavour and I would add a small piece of rock sugar in the soups. If you are using chicken, do not cook with the skin and for meat, inform the butcher to give the leaner parts or bony part…. if not the soup would turn out to be oily and hard to drink. Sometimes, the soup may sort of ‘stink’ with stuff floating on it making the soup look unappetizing. To solve this, before putting the meat/chicken into the soup, we would scale a little with hot water. Basically just boil some water in the wok and then when the water is boiling, turn off the fire. Put the meat/chicken/bones and move them around a bit for less than 5 minutes (the aim is not to cook them). You would see blood and also some meaty flakes comes off and the clear water will become murky. Then rinse off the meat using cold water before putting into the slow cooker. Usually Chinese restaurants would not bother to do this- because it would reduce the concentration of the soup. Instead, they would just add in lots of chicken cubes or MSG to mask off the taste and yet still have the soup look thick enough. Basically I bought the herbal ingredients in a dry form and soak them for a short while. Then I just place all the ingredients in the slow cooker. I would add hot water and place under “High” if it is for a few hours. Usually I would make the soup at about 8.30am and drink about 12pm when I have my lunch. I tend to boil more on herbal soup because I could keep the herbal ingredients are dry and can be kept for long time. As for the bones and meat, they could be kept in the freezer. There were a few time where the vegetables I had bought ended up rotted because I did not have time to use it. For ladies, it is also good for you to boil such soups right after you completed your period (menstruation) -because in TCM, it is believed that our body would become weak after losing blood and we need to replenish the nutrients (some of my more traditional friends would take special Chinese herbal pills or boil the ‘pak chan’ herbs, consisting of the most bitter concoction which I could never get myself to take). 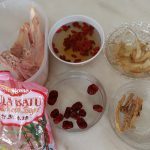 Even if you already have menopause, it is good to take such soups to maintain a good immune system and slow off the effects of degenerative diseases. Why do I produce very slimy, thick mucus whenever I drink stuff like juice? ⇐ Click on the Category located below the title to view other similar articles. This site is customized by Yin Teing using Thesis wordpress theme. Hosted by SiteGround. My other sites: Full site listing at www.yinteing.comView: Site Disclaimer and Amazon Affiliate Disclaimer© 2007-2018 by Yin Teing. All rights reserved.